What should I do if my waterline lets go? Turn off the main valve at the meter and call us right away. 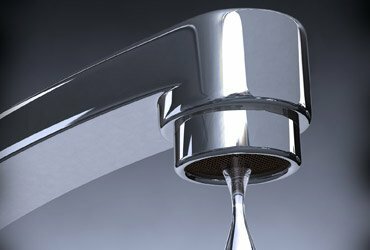 What does it mean when water comes up through my floor drain? Usually this means the main sewer or branch line is backed up and needs to be cleared. Is it possible to know what is causing my sewer problem? Yes. We can send our camera down to tell you the actual cause and location of your problem. Should I repair or replace my sewer? You could set up a maintenance program for regular cleaning or repair or replace the sewer to prevent further backups from occurring. What is the white stuff on my walls in the basement? The white substance on your walls is called efflorescence. This is the breakdown of the bonding agent used to hold your foundation together. The water that is penetrating the foundation is breaking the bonding agent down. Why is my basement leaking? Basements can leak for various reasons. The weeping tile that surrounds most homes could be plugged, causing water to build up around the house. The foundation may need to be waterproofed stopping any water from penetrating the concrete or block wall. Or you could have cracks in the foundation wall letting water into the basement. Is water leaking into the basement serious? Water seeping through a foundation can cause cracking, bulging, foundation deterioration and health issues. Severe mold can buildup causing problems for those with allergies and respiratory problems. Can my wet basement be fixed from the inside? Yes. Under certain circumstances you could do an interior repair. This is typically by either a crack injection or an interior perimeter tile system. Our belief is that an exterior repair is always best, where possible. An exterior repair stops the water from ever touching the bare foundation wall. Where an interior repair allows the water to penetrate the wall then redirects it to an interior drainage system. My yard floods every spring, can it be fixed? Yes. We could solve this problem by installing a yard drainage system sometimes called a 'french drain'. This will remove any surface water and direct it away from the house. Is there anything I can do to prevent my basement from leaking? Yes. Make sure you have proper grading away from the house. Soil around the house should not come above the brick line. Downspouts and sump discharge lines should be directed away from the house. Yes! Our warranty for any exterior sewer or waterproofing repair is 20 years and any interior repair is for 5 years. Both warranties are transferable. How much will the job cost? It all depends on how serious the problem is and what needs to be done to rectify the problem. Our estimates are free of charge and completed by experienced tradesmen not salesmen.